I recently had the chance to participate in a research initiative called the Fairness in Precision Medicine project, led by the nonprofit organization Data & Society. The project examines the potential challenges we face in this emerging, data-driven era of medical research and healthcare. The PI on the project, danah boyd, is a scholar whose work examines the intersection of technology and society. She’s been an inspiration to me since I read this Fast Company article called “Generation Flux” back in 2012. So needless to say, I was thrilled to learn about and get a chance to contribute to the project! “Supported by the Robert Wood Johnson Foundation, the report is the first in a new series of research projects at Data & Society focused on the future of health data. For my contribution, I discussed the potential for unintended and negative impacts of highly personalized health information and recommendations, especially as big data and digital technologies are increasingly tapped to provide such information. I was honored to be a contributor alongside my mentor at NCI, chief of the Health Communication & Informatics branch Brad Hesse, as well as University of Utah bioethicist Jim Tabery. 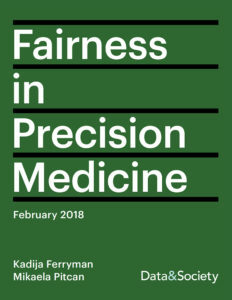 The Fairness in Precision Medicine report was published February 26, 2018. Learn more and download the (free) report here. I was also interviewed for a related piece that explores on potential unintended consequences of conveying genetic information to patients. Read The Risks of Knowing Your Risks too! What precision medicine projects am I working on? Visit my project page. This entry was posted in Uncategorized and tagged Data & Society, ELSI, Fairness in Precision Medicine, genetic communication, precision medicine, precision medicine communication on February 28, 2018 by Chelsea.